Bananas are commonly used for cooking Bananacue, making it into Turon, or even making banana pancakes. There are many known benefits of bananas BUT did you know cooking it actually reduces the nutrients your body could get from it. This especially applies for the Cardava bananas, most commonly known as the “Saba Banana”. “Saba Banana” is packed with different kinds of nutrients that would benefit you in many different ways. Learn the health benefits that you can get from eating “Saba Banana” below. If you take sports drinks to energize you before your exercise, time to replace that sports drink with Saba banana instead. A fulfilling snack that is packed with enough calories to give you that energy boost you need before working out. So, now if you’re exhausted or hungry, eat Saba Banana rather than any sweet or sugar filled meal or drink. 2. Good for the Heart. Food that is rich in Potassium is great for our hearts. They help cut down the chances of strokes, regulate and maintain our heartbeat, keeps our blood pressure low and steady, stabilizes the water levels in our body, and it improves the circulation of oxygen in the brain. And Saba Banana is packed with Potassium! So this little yellow snack may not heal your heartbreak but it sure can make your heart feel better. Saba Banana is a great source of natural fiber. And natural fiber builds up and improves your bowel movement, eventually regulating it. But do not worry, this would not lead to diarrhea. It just balances what needs to be balanced for good flow and movement. The extreme pain of cramps, irritability, and mood swings during a woman’s period is difficult to set aside and forget. BUT, do you know that bananas can be a woman’s best friend during this time of the month? Vitamin B6 is found in large amounts in Saba Bananas. And there are researches that have concluded that B6 actually decreases the pain brought by the “red sea”. Yes, bananas are better relievers than chocolate ladies. Did you have too much to drink last night? So now you’re having such a hard time getting up because of your tummy ache and headache, there’s a simple solution for that. Saba Banana will help you solve that problem. The vitamins that your body lacks because of all that alcohol will be restored by eating Saba Bananas, thus making the aftermath of your drinking sesh last night easier to handle. The peels of the Saba Banana can help treat the flat or common warts on your face. Yes, every part of this superfood is useful for you. 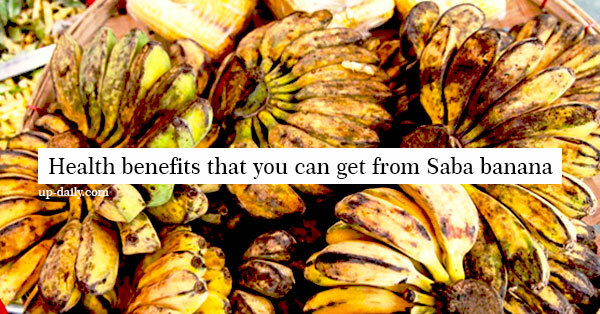 There are so many health benefits you can get from Saba Banana. From its peel down to its core, different benefits can be given and distributed to different parts of your body. Make Saba Banana a staple food inside your kitchen and your lunchbox.